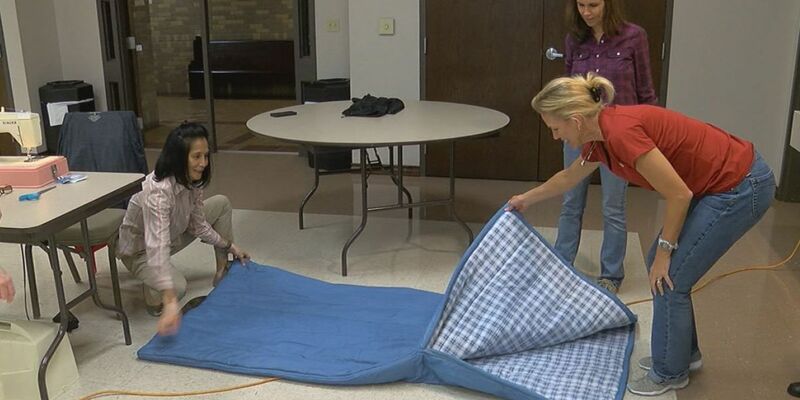 TYLER, TX (KLTV) - Just as the first freezing temperatures of the season arrive in East Texas, one ministry is putting their sewing skills to work in hopes of helping the homeless. Volunteers with St. Veronica's Compassionate Sewers are fashioning sleeping bags from donated fabric and supplies. At least 233 people in Smith County were listed as homeless, according to a January 2015 Housing and Homeless Report by the East Texas Human Needs Network. The ministry finds its inspiration from the woman who offered her veil to Christ before his crucifixion. "(Saint Veronica) came up and she sees Jesus walking and carrying this cross," said volunteer Deborah Streckfus. "And she saw underneath the deformation of all the torments that he had and she saw a human being." The ministry's volunteers have varying skill levels. Shawna Tankersley learned to sew from her mother and grandmother and worked in a garment factory in high school. "We always pray for the homeless but sometimes prayer is not enough and we need to actually get out there and help them," Tankersley said. While Tankersley has sewn her entire life, others may have little experience, which creates an opportunity to learn knitting and stitching techniques. The production process begins with selecting the right fabric for the interior and exterior of each sleeping bag. Most of the material is donated from cleared-out collections or unfinished projects. Each piece is measured, then cut using instructions and templates. Volunteers work to stitch patches of fabric using sewing machines, rip seams, quilt, and cut batting. "We also needed people to do the ironing so that we could press the seams," Tankersley said. "It's easier to sew when they're pressed." A layer of Mylar helps keep the moisture out and reflect body heat, as many homeless individuals sleep on the ground or exposed to the elements. Working with so many layers of material can create challenges for even the most experienced seamstress. "My needle would sometimes get stuck and we would have to do just a little workaround," Tankersley said. "The thread broke several times because it was so thick and so we'd have to re-thread and refill the bobbin several times." Neckties and long strips of fabric are fashioned into straps that will tie a rolled sleeping bag. Despite any obstacles, the only real requirement to participate is a servant's heart. Elena Petosa was curious if they would complete their project in one session. She said she was initially drawn by the opportunity to touch the lives of others who sometimes feel forgotten. "One heart, one mind, one spirit. I think this blanket is formed within that love." Streckfus says this gift of compassion is a labor of love. "Once they (the blankets) leave our hands, then that's leaving it in the Lord's hands. Then we trust in him to do what he can do with what we've done." St. Veronica's Compassionate Sewers plans to meet regularly to complete projects for various groups and individuals in need. Organizer Denise Rite says volunteers and materials are needed, along with prayers.